College Student Loses 57 Pounds, Wins $500! 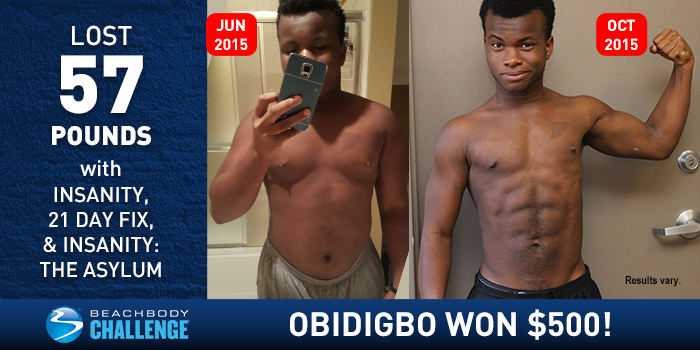 Obidigbo Nzeribe lost 57 lbs. in four months with INSANITY, 21 Day Fix, and INSANITY: THE ASYLUM. 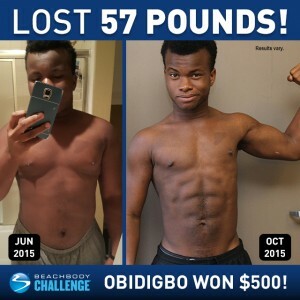 He entered his results into the Beachbody Challenge, and won the $500 Daily Prize for February 22nd! I have to admit: I was super clueless before I found Beachbody. I was already exercising, but my diet plan was horrible. I really saw no results whatsoever, and that caused me to give up a lot of times. So for comfort, I told myself I was “fit” and “buff”. My pant and shirt sizes were going up; I was running out of breath; I would sweat more than usual; and I was just uncomfortable with my body. One day I told myself something had to be done, and that same day, I found my Beachbody Coach, Justin Ruble. Finding Beachbody changed so many misconceptions I had about my body. I believed I couldn’t lose any more weight at 230 pounds. I also believed I wasn’t supposed to do intense cardiovascular activities. I completed INSANITY, 21 Day Fix, and INSANITY: THE ASYLUM. None of them were tougher than getting up and going to the gym. Hitting play with a scheduled workout program and a Coach always checking up on me gave me the drive to do this every day. Now I feel like a beast. INSANITY: THE ASYLUM is awesome! It helped me a lot, because I could be feeling down, but once I was 10 minutes in, I had so much adrenaline pumping and so much energy. Shaun T also helped a lot, being the boss trainer that he is. Before I ever started working out, I was 230 pounds. After INSANITY, I was 176 pounds. Now, after INSANITY: THE ASYLUM, I am 163 pounds and have lost 3 inches off my waist, 3 inches off my chest, and 1 inch off my hips. I’ve gone from regular to beastly. I feel great about my body; my self-confidence has grown a lot; and I also know better about my body now. The Challenge Group was an awesome resource to keep me in check. We had different tasks each day and had to make daily reports, which helped a lot because I didn’t want to be the slacker holding the group back. My Coach was always checking up on me. He supported me in so many ways. He gave me tips on what to do, what to eat, and what not to eat. My Coach, Shaun T, and Autumn were my support system throughout the workout. How did a Beachbody supplement, nutritional product, or program (such as Shakeology or Beachbody Ultimate Reset) support your transformation? What are the greatest benefits you gained? Did you see benefits to your energy, sleep, mood/mental clarity, digestion/regularity? 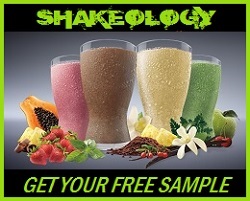 When I first took Shakeology, I wondered if it was illegal because I would push past my breaking point and then some. It tasted so good and worked great also. 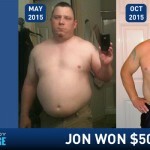 If you are serious about making a change and are tired of all your own BS excuses as to why you’re not able to commit to getting healthy…then I encourage you to reach out to me at coachtodd@rippedclub.net to see how we can get you started on that journey, just like Jon did. Or of you like, you can get started now by Joining RIPPEDCLUB. 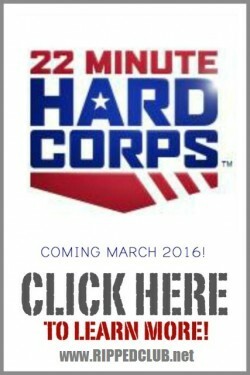 Once you click that link and get signed up, you’ll be getting an email from me with your next steps! Cant wait to have you on the team!